By Chris Williams: Michael Koncz, the adviser for Manny Pacquiao (54-5-2, 38 KO’s), is saying that Pacquiao’s sparring partners will get $1,500 if they can put the Filipino on the canvas in the sparring sessions to get him ready for his November 23rd fight against Brandon Rios (31-1-1, 23 KO’s) in Macao, China, according to the Manila Bulletin. The old offer was $1,000 in some of Pacquiao’s recent training camps, and supposedly no one has ever collected it. I’m not sure if this is really a good idea to be giving the sparring partners extra cash to knock Pacquiao down. He’s coming off of a bad knockout loss to Juan Manuel Marquez in his last fight, and it might not be smart to be enticing sparring partners to try hard to drop him. It’s not a lot of money. I guess if they really wanted to make the sparring partners go all out to try and drop Pacquiao, they might want to raise it to $100,000. That would be huge money for a sparring partner, and I could see Pacquiao getting dropped quite a few times if they start offering money like that. $1,500 is nothing. If I was Pacquiao’s sparring partner, I wouldn’t try and drop him for that kind of money because I’d be worried that I’d be kicked out of camp for putting him down. But if they were to sweeten the pot to $100,000, I wouldn’t have any problems going all out to drop Pacquiao. I would be like a bull with a red handkerchief in front of my face if they waived that kind of money with the conditions that I drop Manny. They’d have to pull me off of Pacquiao for that kind of cash. I think it would be the same for the sparring partners. But seriously, they shouldn’t even be doing a lot of sparring with Pacquiao, because he should be taking it easy in this training camp to rest his brain as much as possible for the fight with Rios. The last thing Pacquiao needs is for his brain to be getting jarred around before facing a big puncher like Rios. 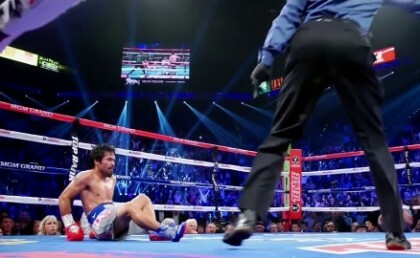 If anything, Pacquiao should reduce his sparring to just 20-30 rounds for the entire game. He’s probably already done more than that, but he should nip it in the bud and focus on his speed, ring movement and defense. At his age, Pacquiao needs to be backing up on his training because he’s going to leave his fight in training camp rather than in the ring. If he’s going to be going to war with sparring partners all camp long, we could see a ragged Pacquiao coming into the ring on November 23rd, and end up being easy pickings for the younger Rios.